Fill power is a measurement of how well the down in an item can insulate. Essentially, the amount of fluff and down that is needed to keep you warm. The best quality down does a better job with less down then lower quality down. The measurement of fill power is on a scale of up to 900. This number is determined by an experiment in which the down is compressed in a plexiglass cylinder. The larger the number the higher quality in down. For example, 400 is considered the low end of good down, 550-700 are very good down items and as you head up to 900 you are moving into luxury down territory. Fill Rating – Those items that have good down fill power will have that rating put right on the product. That means you should see a number like 400, 600 or 700. The higher the number, the better. If you don’t see a rating number on a down product, that is likely because it has fallen below the 400 range and is not considered decent quality. Down in Comforters – You always want to make sure to get a decent fill rating in comforters. Comforters with a lower fill rating are more likely see the down move around and create cold spots, where it is not insulated. Down in Pillows – While you may think the higher level of fill power in pillows would mean a stiffer pillow that is not true. In pillows you must not only know the fill power of the pillows, but also how much down is in the pillow as it will still take more of a higher quality material to create a firmer pillow. Lounging in bed with a good book and a cup a tea is one of life’s little luxuries. The The Bedlounge Pillow is designed to make your down time even more comfortable or add a little comfort to the pain of staying up late to work. Designed by a renowned doctor specializing in back problems, this reading pillow adjusts to provide custom support to our upper body, head, neck and shoulders. In addition to reading or working in bed, the Bedlounge pillow can be tossed on the floor for a fun night of movie watching. Or, if you have a medical condition, such as acid reflux or a surgery requiring you to sleep upright, then this back support cushion will keep you propped up while you sleep. 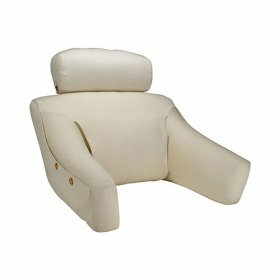 A lightweight internal frame is surrounded with foam and fiber to provide a unique best rest that can be adjusted to with pivoting arms, a movable lumbar support and an extendable, tilting headrest. A removable cover with pockets is fashioned in a nice quality fabric can be tossed in the washing machine for easy care; many colors are available to suit the requirements of your décor. For travel or storage, this pillow folds up and is completely portable and light enough for a petite woman to tote. Although the Bedlounge sounds dreamy it is quite expensive and seems to elicit a love-it or hate-it response from users. Those who love it praised the length of the arms, the easy ability to get in and out of it, and the quality construction. Those who were dissatisfied likened the Bedlounge pillow to much cheaper reading pillows that you can pick up at a discount store for a fraction of the cost. Where Can I Buy The Bedlounge Pillow The Ultimate Back Wedge – Bed Rest – Back Support – Reading Pillow? Made from plush and textured fabrics, the NoJo Ladybug Lullaby 6 Piece Crib Set comes with a comforter, a bumper, a sheet, a dust ruffle, a diaper stacker and a window valance. Fitting standard crib mattresses that measure 28 x 52 inches, the set can be put in the washing machine and dryer and is part of a nursery collection. Featuring a lot of pink, the set is generally used in nurseries for baby girls, but can be used for boys as well. Most of the components are made from 100 percent cotton and the pattern features various designs, ladybugs, butterflies and flowers. 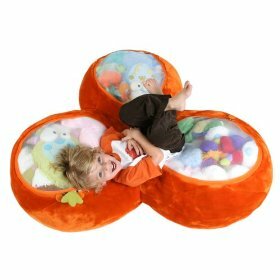 The entire set is textured in various ways and different, plush fabrics are used to capture the baby’s attention. In general, reviews of the NoJo Ladybug Lullaby 6 piece crib set are very positive. Most consumers were very impressed with the look and style of the set and were pleased with how it looked in a similarly-themed nursery. Because the set uses so many different colors (including pink, blue, white, green, brown and cream) it is easy to find coordinating accessories to compliment the set. Though customers who reviewed the product said that it held up well in the wash and was very durable, one lady did note that it was wrinkly when it came out of the dryer and needed to be ironed, but other than that she is more than delighted with the product. 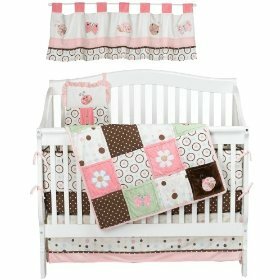 Buy Now the NoJo Ladybug Lullaby 6 Piece Crib Set? Here is a great way to get the kids to pick up and store their soft toys. The Boon Trio Animal Bag is an oversized, plush bag that has 3 large, zippered windows covered with transparent, durable mesh. So your kids can see where their favourite toy is through the mesh. 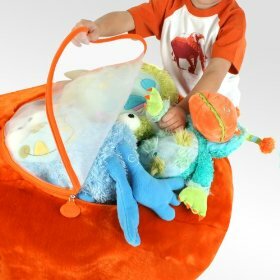 Once the bag is filled with stuffed animals of all shapes and sizes, the kids can then use the Animal Bag as a soft seat. How cool is that. So the Boon Trio animal bag is not only functional it is also practical. Children will be so happy to have this soft plush seat to roll around on that they will be more than eager to collect up all their soft toys to store them in the bag. The Boon Trio Animal Bag is made from high-quality, breathable fabrics which can be machine washed and or dry cleaned. And this picture shows you just how it works. This little boy putting all his stuffed toys into the bag so that he can use it as a soft cushion. Where Can I Buy the Boon Trio Animal Bag for Storing Soft Toys?